CVTA Vision: Connecting people to the outdoors through a system of trails. 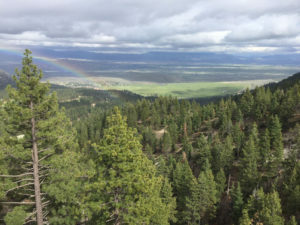 CVTA Mission: The Carson Valley Trails Association is a nonprofit, volunteer based organization working with partners to provide public access through a recreational trail system for present and future generations to enjoy. Our Fall / Winter 2018 issue of the CVTA Trail Connections newsletter is now available! We are interested in your feedback on the Carson Valley Trails. Where is the trail crew working? Click for details. CVTA has a Facebook page! Be sure to click “like” if you want to stay up-to-date on project developments, trail building opportunities, hiking events, and many other exciting happenings with the CVTA! For all you slackers who have not yet trained your dogs to pick up their own poop, PLEASE clean up after your pooch. Leaving poop on the trail is disrespectful to other trail users and also a public health hazard. This is a big problem at Fay Luther which is especially popular with dog walkers. Carson Valley Trails Association shared a post. Great story in the Nevada Appeal about one of Carson Valley's own Jared Marchegger. According to Jared, he owes his success to training on our local trails especially the Clear Creek Trail. Congratulations on winning the Gatorade Player of the Year Award for cross country and signing with the University of Nevada, Reno. Notice of burning to Clear Creek Trail users: This appeared in the paper today. We don’t have much more info at this time but we will update the post as we learn more. If it seems like our trails have been getting a little more attention than usual, thank the folks at Carson Valley Nevada. While it does mean that we may have to share our trails with some out of town guests, it speaks to the truth that trails are an important driver for economic vitality in our community. Here is another great article from the website "Only in your state". This little-known hike boasts some of the most spectacular views in the state. You'll definitely want to complete it soon. Carson Valley Trails Association is with Katie Carlo at River Fork Ranch.